We offer a wide range of BTU meters that are used in chilled water, condenser water, and hot water systems for both commercial and industrial buildings. These meters include: temperature range, environment or flow temperature, temperature sensor type, differential temperature accuracy, battery life, working current and hibernating current. Dimensions such as length, width and weight are also important to consider. There are several different temperature ranges for BTU meters. Being a leader in this industry, we are devoted towards providing a premium quality array of Chiller Application BTU Meter. 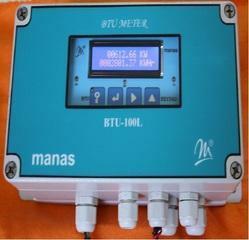 Availability of display of Chilled Water flow, Power, Temperature etc. 4-20 mA output proportional to power output. 16x2 LCD, 9 digits for total energy & 5 digits for instantaneous power. The engineering unit can be selected as either KW & KWHr or BTU/Hr & BTU. Communication port RS 232/485 is available with MODBUS RTU. Based on calculations of thermal power & energy consumed through measurement of flow, temperature difference of inlet & outlet of the medium. Suitable for Thermic fluids HYTHERM 500, HYTHERM 600, DOWTHERM A, DOWTHERM T etc. 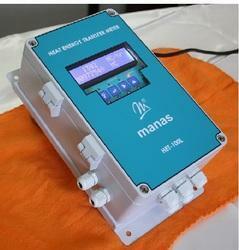 We offer a wide range of Heat Transfer BTU Meter. Looking for BTU Meter ?